SNS is a Dutch bank that believes that banking can really be done differently. Better. More normal. An accessible bank with simple and understandable payment, savings and mortgage products. With products that offer customers a clear advantage. SNS has around 250-350 employees working throughout the Netherlands. To inform employees about developments in the mortgage area they organise presentations in regional meetings. SNS sees as a big advantage of a webinar that everyone gets the same information at the same time. “The most important result, however, is that with a webinar you also reach people who were absent because they can watch the webinar afterwards. And with the webinars we reach more than 75% of the target group”, SNS indicates. The webinar is promoted via a news item on the intranet and an email is sent to all managers. SNS indicates that it has proved most effective to send an invitation via Outlook with a link to the webinar. “Then the webinar is immediately scheduled in the agenda”. The employees of SNS rate the webinars as positive. They indicate that they enjoy looking at the webinars together (their own team) so that they can continue talking about them, eg what are we going to do as a team with this campaign, or what do these developments mean for us? “SNS gives about 5 webinars a year and we learn from every webinar,” says SNS. Now we send the invitation earlier and via outlook. And there are standard 2 speakers (or more) instead of 1 because this gives more dynamics during the webinar. As a tip for other organisations starting to give webinars, SNS indicates that good preparation is essential for a successful broadcast. 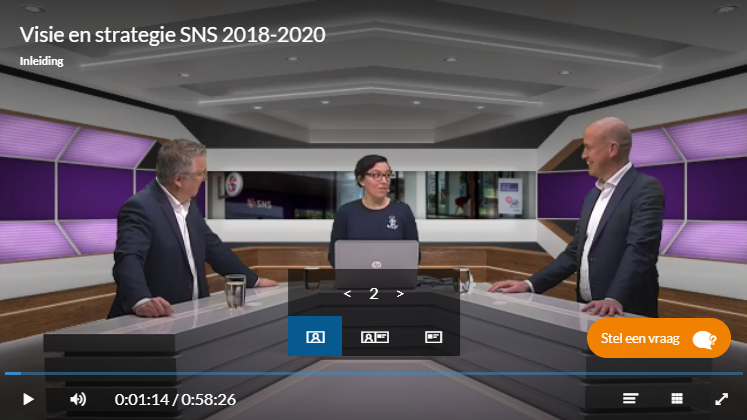 “In addition, it is very important to give quick feedback to questions that have not been dealt with during the webinar itself” according to SNS. “A colleague has already worked together with Company Webcast before and that is very satisfying, and you are recommended as The webcast supplier”. Would you also like to know how you can use webinars to improve internal communication? download the eBook: Internal Communication Webinars.